SAFFORD – Late Saturday night, Feb. 24th, Safford police officers were dispatched to the 900 block on 10th Street in reference to a welfare check due to arguing and the possibility of physical violence. When an officer arrived at the residence, he saw a man peek his head around the corner of the home and quickly ducked away to the back of the residence. When the officer walked along the side of the home to the back yard he saw a man standing in the yard with his arms crossed. 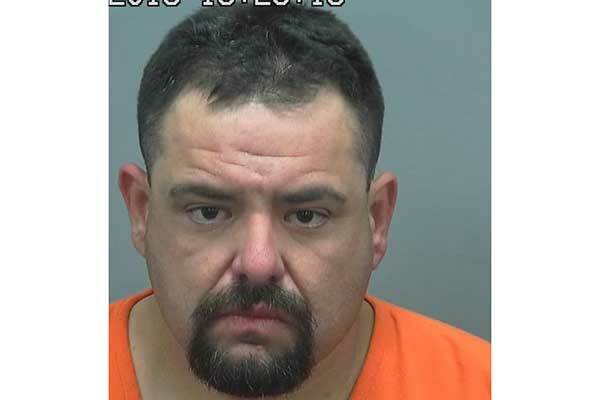 The officer recognized the man to be Greg Aguilar according to their police database records. The officer approached Aguilar asking him what seemed to be the problem, to which he answered that there was no problem and that he was just in the back yard. The officer informed him the reason the police were there was because someone had reported that there was a verbal confrontation going on and they were worried that at some point it had become physical. Aguilar stated he was not engaged in a verbal argument and that he was in the back yard to avoid a conflict. The investigator advised Aguilar that there was an accusation that he often carries guns. The officer could see large, protruding objects from his pockets and creases in his loose shirt that are consistent with firearms. Aguilar was asked if he was in possession of any firearms and he stated that he was not, shaking the outside of his pants with his hands. When he did this, the officer could hear metal objects colliding together inside his pockets. The officer advised him that he was going to pat him down for weapons. While the officer conducted a pat down on Aguilar, he could feel an object consistent with a methamphetamine glass smoking device in his front pocket. When Aguilar was asked what the object was, he attempted to reach for it. The officer advised him not to reach for it. The investigator removed from his pocket a glass smoking device with burn marks and a white residue consistent with methamphetamine. Aguilar was placed into handcuffs and additional officers were called. The officer walked Aguilar to the front of the residence where he continued a full custody search. The investigator found a white crystalline substance packaged in a red plastic wrapper that through training and experience he knew to be methamphetamine. From Aguilar’s hip, the officer removed a large knife from a holster. Aguilar was placed under arrest for possession of a dangerous drug and possession of drug paraphernalia and booked into the Graham County Jail.